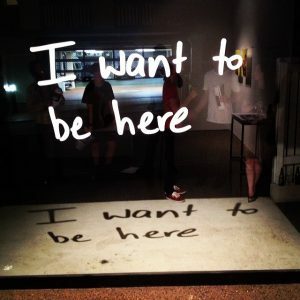 ‘I want to be here’ 2014, vinyl text on glass window with spot light. Commencing in March 2015, MAAP SPACE will host Louise Bennett in a special artist residency program that will allow Louise to develop new work with full access to Media Bank equipment and gallery space. This project will enable Louise to process and experiment with raw media materials collected in Indonesia along with other recordings made in Brisbane. Director Kim Machan says of the residency “It is great to have Louise working here. I’ve admired her investigations and thoughtful projects for some time and look forward to watching her work unfold”. It is the intention of this residency that an exhibition will follow later in 2015. Louise Bennett is an artist whose practice negotiates the tension between day-to-day experience and its mediation. Through a combination of digital and hand-made processes she investigates the intersections of online and physical environments. Her work poses questions about how our concepts of and engagements with nature and identity are shifting in contemporary contexts dominated by screen technologies and mediated experiences. Through video, performance, text and installation she interrogates the screen as both a physical and digital space. Her seemingly non-committal personal performances in front of a web-cam and iphone call into question our engagement with online content, communication devices and the internet’s ability to inform our experiences offline. Bennett handles her own image and other captured footage as an interrogation of the screen-based medium in relationship with its subject, as opposed to an interrogation of the subject itself. Louise Bennett is invested in this approach as a means for scrutiny and critique, significantly from her position of unavoidable complicity with the mediated and relentlessly networked environment that is the internet. Bennett has completed a bachelor of Fine Arts Visual Arts with honours from the Queensland University of Technology. She was awarded The Melville Haysom Memorial Art Scholarship from QAG/GOMA in 2010 and was awarded an Arts Queensland Career Development Grant to participate in the Ionion Centre of Culture and Arts artists residency program in Greece, 2012. Bennett’s work was shortlisted in the 2011, 2012 and 2014 National Churchie Emerging Art Award and shortlisted for the IMA’s Jeremy Hynes Award 2011. She has exhibited in solo shows in Brisbane with David Pestorious Projects, Boxcopy and the Ionion Centre for Culture & Art in Greece. Louise has shown in-group exhibitions at Spiro Grace Art Rooms Gallery, many Australian artist run initiative’s including feminist ARI Level in Brisbane, Paper Plane Gallery in Sydney and Screen Space in Melbourne. She is also a director of the artist run initiative Accidentally Annie Street Space. 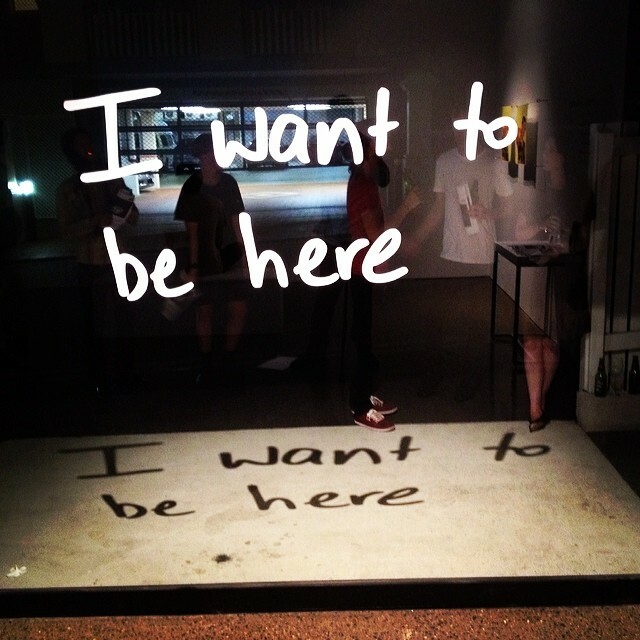 Image caption: ‘I want to be here’ 2014, vinyl text on glass window and spot light.